OMG Posters! 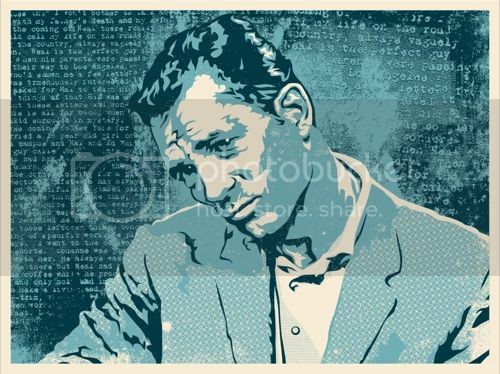 » Archive "Kerouac" Art Print by Joshua Budich (Onsale Info) - OMG Posters! Joshua Budich will release some A/P copies of his “Kerouac” art print today. It’s an 18″ x 24″ screenprint. It goes up today (Tuesday, May 25th) at a random time. The main edition of 50 will be offered at a different time/place (tba). Visit JoshuaBudich.com. EDIT: The main edition of this print will go up for sale tonight (Wednesday, May 26th) at 7pm EST. It is limited to 50 and will cost $35. Visit The Poster District. OK. the release of the Jack Keroac print is TOMORROW at 7PM EST! These have a super low edition of 50, and will go quickly! These are absolutely beautiful prints and are priced at $35 ea + shipping. WHICH IS A STEAL! Here is some additional info : This piece is a portrait of the great beat writer, Jack Kerouac. Featuring writing from the original “On The Road” scroll as a background, this proves to have the classic Bohemian feel! “Jack” measures 24 x18 inch, 2-color print, in cream matte paper. “Jack” is a VERY limited run of just 50, exclusively to The Poster District. They will be $35 + shipping ($12 US, $20 Everywhere Else). CORRECTION – THE RELEASE IS TONIGH AT 7PM…. This is one of Josh Buddichs best pieces in while…. with only 50 pieces… if you want one, GRAB ONE FAST!!!! again, any questions, let me know. ahhhahhhaaah. Poster District & Joshua Buddich go perfect together. Head over there for all of your non-original ideas. A website that is a total knockoff and prints that are traced illustrations. ahhhaahhhaahhhaa. Think back to this post in a year and recognize that these fools made a last minute money grab over these overhyped boring prints. Budich making a Kerouac print is one of the funniest things I’ve seen in awhile. Ahhhhhaaahha.